Pure Whey Protein Body Lean 36! 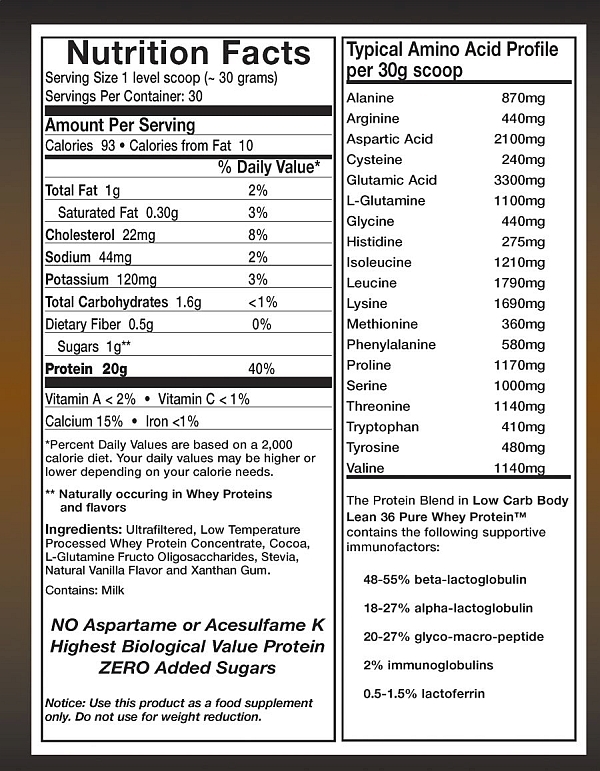 ZERO Added Sugars Added L-Glutamine! without the worry of wasting ingested protein. This stuff tastes great and gives me lots of fuel for my workouts and everyday life. My whole family likes it mixed with almond milk and it tastes great. I started drinking it once a day only 4 days ago as a supplement and I've already noticed my pants fitting better. This protein powder tastes good and doesn't have artificial additives. It does contain stevia for sweetness, but stevia is natural. It is not an artificial sweetener. This is the best I've seen for low carbs and calories with high protein. Brought this protein and love it. It had a lot of amino acids and is natural. Stevia is on label and is a natural sweeter, not a sugar substitute. This is a complete product. Delicious, easily dissolves. Very filling. A great and easy to prepare breakfast or snack.